During his presentation, Wong spoke about what it takes for students to reach their goals in management and professional positions in sports. Glenn M. Wong is a Professor in the Sport Management Department in the Isenberg School of Management at the University of Massachusetts Amherst. He has been a faculty member at the University of Massachusetts since 1979. 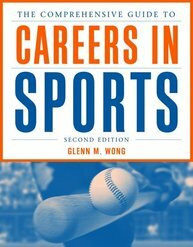 His book, The Comprehensive Guide to Careers in Sports, Second Edition, is due out March 15th. For more information or to order your copy today, visit go.jblearning.com/careers2.